When Lynn Raskin googled Democratic Senator Sherrod Brown, she ended up clicking on an ad for Republican Senator Scott Brown. Screenshot: GoogleLynn Raskin, a Washington D.C. realtor, and her husband, Marcus, a cofounder of the Institute for Policy Studies, have routinely contributed to progressive candidates in tight congressional races during this election cycle. They’ve donated to Rep. Tammy Baldwin (D-Wisc. ), Rep. John Conyers (D-Mich.), and Elizabeth Warren, the Democrat running for Senate in Massachusetts. They’ve also given money to Sen. Sherrod Brown (D-Ohio). Google’s algorithms, not a sneaky Scott Brown operative, are likely to blame. Scott Brown spokesperson Alleigh Marré says that the campaign did not pay to have the keyword phrase “Sherrod Brown” trigger its Google ads. She declined to comment further on the campaign’s online strategy. On Tuesday, a Scott Brown ad popped up when I googled “Sherrod Brown.” (See image above.) 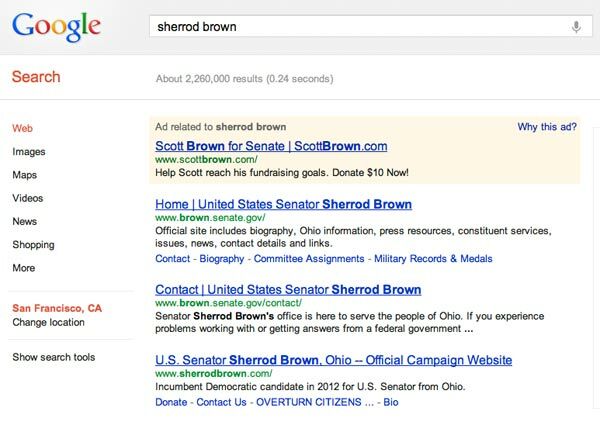 But as of yesterday, a search for Sherrod Brown no longer called up a Scott Brown ad. Scott Brown’s use of Google ads is not new. In his 2010 Senate bid, Brown, a long-shot candidate with a shoestring budget, defeated state Attorney General Martha Coakley in part because he ran “one of the most aggressive” Google AdWords campaigns ever. The Scott campaign reportedly used AdWords to reach users searching for both his and Coakley’s names. So impressed was Google that the search engine behemoth invited Brown’s chief web strategist to give a talk at its Washington, D.C. headquarters. Ordinarily, online ads funded by political candidates must state that they’ve been paid for by the candidate. Two years ago, the Federal Election Commission voted to permit Google to run short text-based politcal ads without disclaimers. However, there’s nothing about the Scott Brown ad that suggests it might be an ad for another candidate. In the aftermath of the mix-up, the Scott Brown campaign has issued Raskin a full refund and she has donated successfully to her preferred Sen. Brown.